After crossing the Lycus River, Darius made his way to Arbela where he paused long enough to hold a council with his surviving officers. Leaving Arbela (then a village, now a city) straight after, he began his journey to the ‘waste-lands’ of Media where he intended to form a new army. Not long after Darius’ departure, Alexander arrived in Arbela. He stayed just long to take its valuables before being obliged to leave by disease caused by the decomposing bodies on the Gaugamela battlefield. He rode out of the village with Media on his left, and Arabia on his right. Alexander’s journey took him through the country of Mesopotamia, so named because it lay between two rivers – the Tigris and Euphrates. By-the-bye, I once read a biography of C S Lewis, which stated that as a student in the 1910s he would go bathing in Mesopotamia. Lewis, however, never visited the near east; his Mesopotamia was a stretch of land between the two arms of the Isis River in Oxford. I wonder if it is still there – the land, that is. Perhaps Oxford University students still go there. I don’t know what Mesopotamia (the ancient one) is like now, but – unsurprisingly given the presence of the two rivers – Curtius describes its soil as being so rich ‘animals are purportedly kept from grazing in case they die from over-eating’. In fact, he says, the soil ‘oozes water’. This reminds me of a plant – I think it was sphagnum moss – that I once walked over in Scotland. You could walk on it without difficulty but there was so much water underneath it from a nearby pond that the moss moved under your feet; very disconcerting! I wonder what the ground in Mesopotamia was like to walk on. Curtius now shifts his attention to the Tigris and Euphrates. They emerge, he says, from the Armenian mountains. At their widest point, the two rivers are 2,500 stades apart. Leaving the mountains, they travel through Media and Gorduene before slowly converging in Mesopotamia. They then wend their way through Babylonia and out into what Curtius calls the Red Sea, i.e. the Persian Gulf. Three days after leaving Arbela, Alexander came to a place named Mennis. Here, Curtius notes, ‘there is a cave with a stream that pours forth huge quantities of bitumen’ which was used to cement Babylon’s walls. 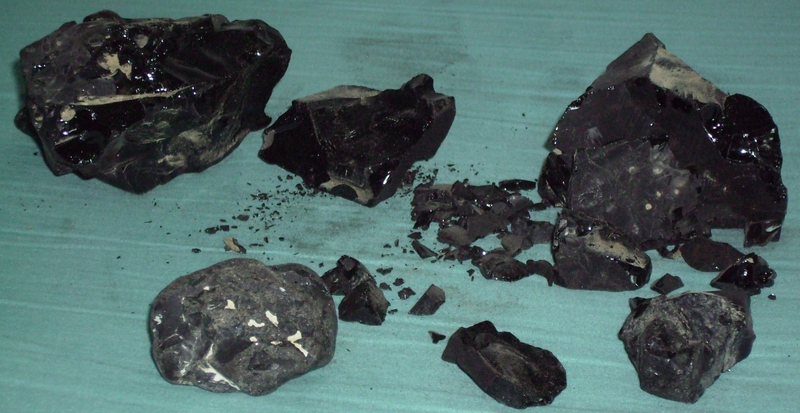 As you can see from the above photograph (source: Wikipedia), bitumen is not the most beautiful substance to look at. But that’s fine, for we know move on to Alexander’s arrival in the that most glamorous – in the full sense of the word – city, Babylon. Upon his arrival, Alexander rode threw the city on a chariot. ‘[F]lowers and garlands’ were laid upon the road in front of him. Altars were set up and ‘heaped not just with frankincense but with all manner of perfumes’. In Matt. 2: 1-12, the wise men bring three gifts to the child Jesus. Each one has a prophetic value. Gold in recognition of Christ the king, frankincense in recognition of Christ the priest, and myrrh in recognition of his death to come. I wonder why the Babylonian priests used frankincense. Was it simply because that is what they believed the gods wanted? Or were they (also) making a comment about Alexander’s priestly nature? Animals were also represented during the Macedonian’s king triumphant march. There were ‘herds of cattle and horses’ as well as lions and leopards which were ‘carried along in cages’. Speaking of the wise men, Curtius reports that the magi followed directly after the animals. You may recall that in the first post in this series, we saw how the Marsyas passed through the walled city of Calaenae. The Euphrates did likewise through Babylon. To make sure it didn’t flood the city, the river was bordered by ‘great embankments’. Behind these were ‘huge pits sunk deep in the ground’ for any excess water. To think that it took London until the nineteenth century to build her embankments. It sounds like the Babylonians would have made Sir Joseph Bazalgette proud, but according to Curtius the true wonder of the city was the (half a mile long) bridge that spanned the river. It was a prodigious feat of engineering because the Euphrates carried ‘along with it a thick layer of mud’ underneath which was infirm ground – no ‘solid base for supporting a structure’. And yet, not only did the Babylonians manage to build the bridge, they also built one that could survive being continuously beaten by water against its supports. We now come to that other construction for which Babylon to this day is renowned – the hanging gardens. Curtius says they were located on top of the city’s citadel. According to tradition, the gardens were built by a Syrian king* at his wife’s behest as she ‘missed the woods and forests’ of the country. Thus, it is really an arboretum. The Syrian king must surely have used Mesopotamian soil as the trees are described as being ‘eight cubits thick and their height as much as fifty feet’. Further to this, ‘they bear fruit as abundantly as if they were growing in their natural environment’. Unfortunately, Curtius gives no further space to the hanging gardens, concentrating instead on the Macedonians and Babylonians – especially their women’s – bad behaviour. If you would like to read the Daily Mail of 2,000 years ago, I commend Bk 5. 1. 36-38 to you.